Since spring is the time for new beginnings, I created a new product line—Shea Butter Mousse! These little moisturizers contain Shea butter and virgin coconut oil combined with different essential oils and fragrances all whipped together for a perfectly light and airy texture to smooth over your skin. The first mousse had to be chocolate, of course. This body mousse smells so yummy! It is scented with a fragrance called “Chocolate Devil’s Food” and it smells like dark chocolate cake. This mousse actually has Valrhona chocolate in the recipe. Yes, this is really made with chocolate! Unsweetened dark chocolate contains tons of antioxidants that are as good for your skin as for your belly. The dark chocolate is mixed into the darker swirl in the tins in the picture. 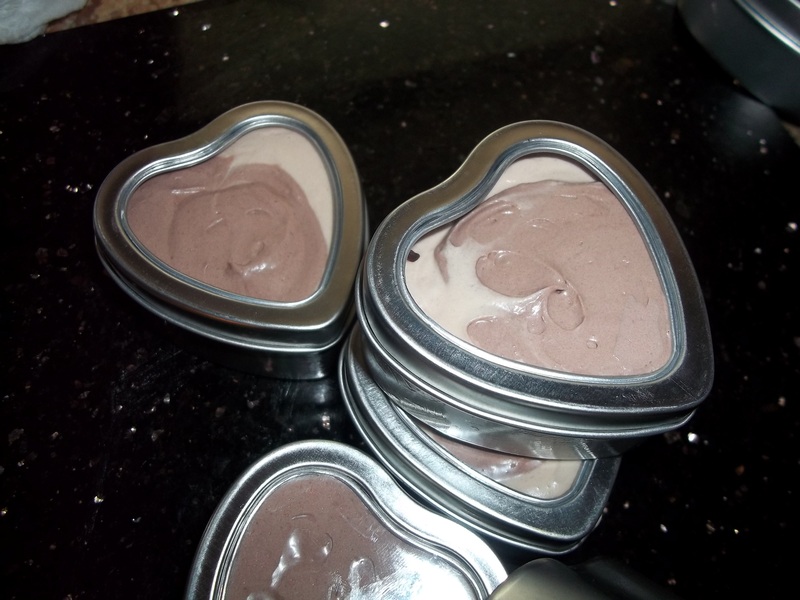 I honestly had to have a piece of chocolate after making this mousse, the smell was so amazing. It also has a slight coconut scent because of the virgin coconut oil. The virgin oil is less refined than ordinary coconut oil and retains more of the good antibacterial, moisturizing qualities of coconut. These little tins will be available in my eBay store this weekend! What are the prices for the shea butter whip? Hey, thanks for the question. The small 1 ounce hearts are $0.99. When you buy three, you get one free. But there will be other sizes and prices that you’ll have to see next week!